For beginner runners it shouldn’t really be a question of how far to run, but more importantly – how much should be done in order to get better? For newbie’s, it’s important to get your muscles and joints used to the feeling of exercise and, even if you're fairly active already, to maintain this aerobic fitness well in to the future. To start with you should measure your running sessions using time as a benchmark instead of measuring distances. If you’ve never tried running before or haven’t done any in quite a while, then you should start by walking for a week or so and then building up to brisk walking, followed by gentle jogging and then running. This should be a gradual progression, but a progression nevertheless. Ideally you’ll choose a route that’s flat and solid underfoot, that will take you around 20 – 30 minutes to walk to begin with. So this could be anything from 1 – 2 miles or 1.6 – 3.2 kilometres in length. To start off with, simply walk the entire route. When you can comfortably walk the full session, then you’re ready to add in some power walking. Don’t attempt to power walk the whole time to begin with, just alternate between different walking speeds, so for example, you might walk normally for 5 minutes and then power walk for the next 2 minutes and so on. On the next session you’d try to increase the amount of time that you power walked for until eventually you're able to power walk the entire session. Next time you'll add in some gentle jogging and build up again as with the power walking before moving on to the final stage, which is running. Once you’re able to run for your chosen time in one go without stopping, then you can start to add distances in to the equation. From here the next logical progression is to increase your run to a certain distance. A 5k route is an excellent place to start and a great time to think about entering a race or fun run to give yourself a little bit more focus and motivation. The idea behind this rather unglamorous approach is to gently ease your body into an activity that you’ve never done before. Starting this way reduces the amount of discomfort you’ll feel, although it is important to remember that any new type of exercise will cause you some aching in the muscles afterwards. Whilst this is something you can’t really avoid to begin with, it’s best to keep it to a minimum, because the more sore your muscles feel, the longer you’ll need to wait between training sessions and this can almost be like starting from scratch each time. Don’t worry if you can’t run very far to begin with, that’s not important. What IS important is that you follow the progression consistently. 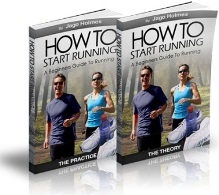 If you'd like a running schedule and training guide to get you started and progressing in the quickest time possible, then take a look here – Running for Beginners. You’ll discover the most efficient and effective ways of training that will help you to make rapid progress whilst training less and avoiding injuries and stagnation.